The Webmaster would like to express his appreciation to all sources of information, including Burton and South Derbyshire's biggest-selling newspaper. In September 2017 Michael Wardell set up a Facebook group called Rolleston on Dove History. It provides a good set of articles and related links and is well worth taking a look if you have the opportunity. After a year of highly successful charity fund raising, Cllr. Mrs Beryl Toon having just completed her term of office as Mayor of the Borough of East Staffordshire, thanked everyone for the backing that she has received from the local community. The support that she has received from the people of Rolleston has been especially important to her. Beryl has now distributed her total fund of £28,956,54 to her three chosen charities. Beryl is a long-time supporter and a current Trustee of the Almshouse Charity. She champions both its social function and its importance as a historic feature of the village centre. She also appreciates the costs involved in maintaining such a building for 21st century living. 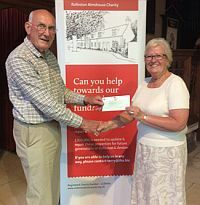 The picture above shows Beryl presenting Tom Martin, Chairman of the Almshouse Trustees, with her charity cheque. Congratulations to Mrs Bernadette Roobottom, a village resident for the last 12 years. The Order of the British Empire was awarded to Bernadette for her outstanding contribution to Education. Supporting Head teachers acknowledge they had benefitted from the excellent role model she provided. Bernadette was always incredibly generous in sharing the outcomes of her research and offering training and support to Head teachers in the area. However, she always put the children first; they remained at the heart of everything she did. Bernadette went far beyond what was required, devoting hours upon hours of her time to ensure that all the children in her care benefited from the very best education possible. This was acknowledged by Ofsted, who awarded her school, Shobnall Primary, two successive outstanding reports. Much of Bernadette’s success is down to her tireless efforts and hardworking nature, her sound knowledge of what makes for outstanding teaching and learning and her creative and artistic flair. The weather was not kind to us this year. The drizzle early on meant about a quarter of the entrants didn’t turn out. The early rain also meant that Gemma Bowers, who sings in the Club car park couldn’t perform (rain and electrics don’t mix). Unfortunately the fair organ is broken (temporarily) and so we were without most of the music. The bad weather also meant that the Dakota fly past didn’t happen. However the day eventually brightened up and everything went really well for a good part of the day. Then at about 2.30 the heavens opened. All the cars made a dash for the exit and it was left for the helpers to clear up in the rain. That is the bad news. The good news is that everyone there said they had a good time as usual and attendance was very good. We were very lucky this year to be sponsored by TL Darby who showed the new MGs they are now agents for. 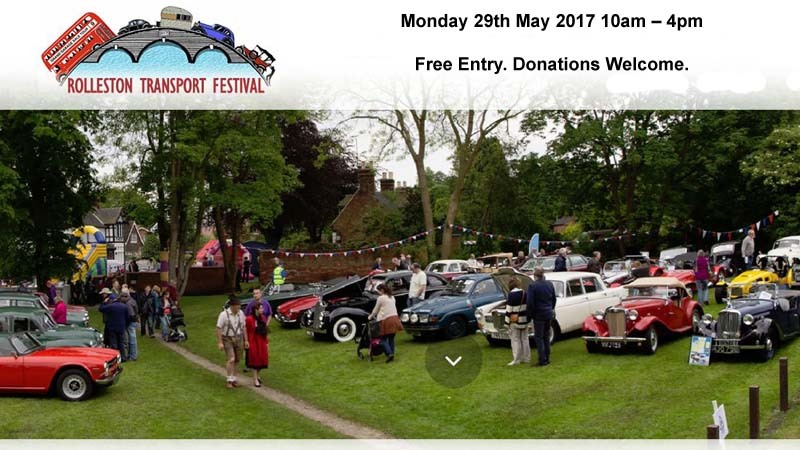 The day raised approximately £4,500 which will be split equally between St Giles Hospice, Midlands Air Ambulance and St John Ambulance. The event is now quite complicated to stage and needs a lot of help. Unfortunately the number of helpers was down slightly on previous years. We need more help on the day if the event is to carry on as usual. It isn’t very onerous and is enjoyable. Please put the date in your diary – the late May Bank Holiday – and volunteer to help for just two hours. Despite the poor weather it was good to see the village so busy. 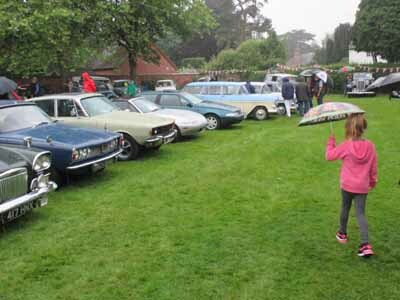 Hopefully visitors enjoyed seeing the vehicles, grabbed a bargain or two from the St Mary's Grand Garage Sale and unlike my Dad and I didn't get too wet. It might prove a popular addition to have a few boats as well next year (Webmaster)? As some of you are no doubt aware, after 22 years we have sold the Newsagents and Post Office and decided to move on. Mum and Dad are retiring to enjoy gardening and their grandchildren. We have enjoyed every minute of our time in the shop (even the early mornings) and have met some wonderful people who we now class as friends as well as customers. I would like to say a huge thank you for all your custom over the years and for your generosity and support during our fundraising for Birmingham Children’s’ Hospital who saved our daughter Evie’s life. 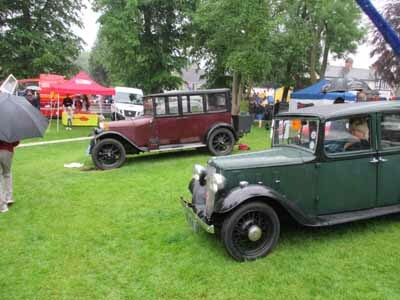 We have managed to raise in excess of £40,000 which is largely down to the people of Rolleston. All three of our children were born here and have known nothing apart from Rolleston and so I’m sure they, like us, will miss many of you. I am hopefully going join Derbyshire Constabulary as a Police Officer, subject to references and a fitness test so I’ll be continuing to work with the public. We as a family are moving to Stretton, so will not a million miles away and the children will still be at John of Rolleston Primary School so you’ll still see us about. I must also say a huge thank you to Maggie, Sally, Jane and Carol as well as the countless paperboys and girls, and Saturday staff who have worked so hard for us. Without them we simply couldn’t manage. I wish you all good health and happiness in the future and finally would like to ask you all to welcome and support the new owners, Gary and Pamela, because without customer’s support independent shops will just disappear. Thank you once again, we take many happy memories as we move onto new pastures. 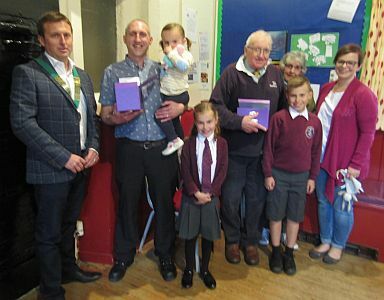 The picture shows the Starbuck Family receiving their well deserved Rollestonian of the Year Awards. This year’s ‘Flight’ themed Quiz, written by Robin Skinner was very well received. Gill Booth from Beamhill Road scored full marks of 100- she is to be congratulated. In joint second place, scoring an impressive 99, were Julie & Steve Eszrenyi, Lesley Beer & Cherry & Arnold Burston. 20 people scored above 96.